Ground source heat pumps work by radiation from the sun heating the earth. The earth then stores the heat and maintains it at a temperature of around 9-11°C at just two or so meters down � even throughout the winter! Thanks to ground source heat pumps we can tap into this constant replenished heat store to heat our homes and hot water. 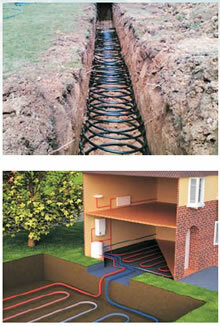 Ground Source Heat Pumps use pipes which are buried under ground to extract heat from the earth. The heat can be used to heat radiators and under floor or warm air heating systems and hot water in the home. A ground source heat pump circulates a mixture of water and anti-freeze around a loop of pipe buried in the ground. 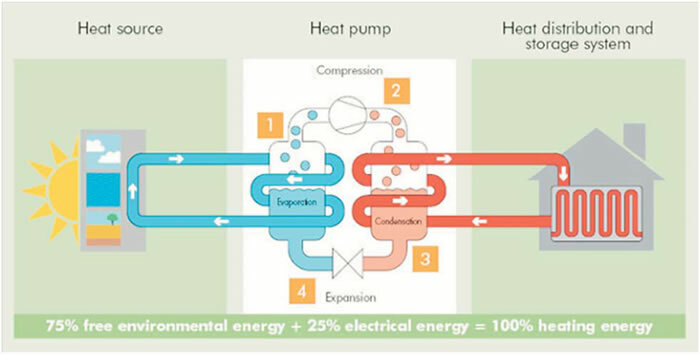 Heat from the ground is then absorbed into the fluid and passes through a heat exchanger into the heat pumps. The ground stays at a constant temperature under the surface, so the heat pump can be used throughout the year and even mid winter! The length of the loops underground depends on the size of your home you wish to heat and the amount of heat that you will need. Longer loops can draw more heat from the ground but require much more space to be buried. If spacing is an issue, a vertical borehole can be drilled to spiral the loops down into the ground instead. Systems differ in size therefore it is hard to pin point an exact price for the cost of installation however, The Energy savings Trust estimates between £9,000 and £17,000 to install in your home. If you would like to enquire about Ground Source Heat Pump installation, please call us on 01670 828695 (Northumberland), or 01751 432096 (North Yorkshire).